If you’ve noticed that your PC is running a bit hotter than what is ideal for your system components, it may be time to start checking out some of the best case fans in order to avoid future problems. There are a broad variety of options available to you when it comes to case fans and it is important to choose the right one for your case. To help you out a bit, we’ve put together this guide to explain how a fan cooling system works and how to pick the best one for your case and components. Before you start shopping, you’ll want to double check the dimensions of your case and how much clearance you actually have internally for a fan setup. In some cases, you may be better off with a multiple fan system, rather than just a single fan. Really, it all depends on what you’re trying to accomplish. What Role Does a Case Fan Play in Maintaining PC Performance? As the technology driving our PC’s and laptops continue to increase in both power consumption and speed, so do our computer’s internal temperatures. If important components such as the CPU and PSU are not kept at ambient temperature via passive cooling, you desperately need a case fan or two in order to help carry the excess heat load. Left unresolved, excess heat will severely shorten the lifespan of your PC components. Active cooling has become an integral part of PC maintenance. That’s where case fans come into play. With proper positioning, your case fans will simultaneously push hot air away from problem areas such as the CPU heatsink and pull fresh, cool air across them. Whether or not aesthetics are important. Does your case provide a view of your fans? Does it matter to you what it looks like? 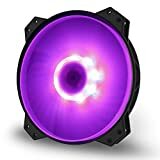 There are fans with cool lighting effects for computer enthusiasts looking for something a bit more unique. What your primary goals are for active cooling. Do you have specific problem areas that are in need of active cooling, or are you taking preemptive measures to protect the entire system? Are you in the market for a new fan because of heat problems, noise levels during operation, or both? How much noise you want to put up with. Noise complaints are most common amongst overclockers, gamers, and professionals that need a lot of processing power. There are, however, some really nice, quiet models available if you’re willing to pay a bit extra. To better understand fan noise rankings, check out this guide. How you want to control your fan. Do you want a simple, plug-and-play fan that turns on and off as necessary? If you’re interested in manually controlling your fan settings, picking up a fan controller for your system might be a good idea too. You can also use software to control your fans. Check your PC’s connector type. There are 3 different types of connector, a 2-Pin, 3-Pin, and 4-Pin. A 2-Pin is a simple, on/off setup; not commonly used in modern computing. Both the 3 and 4-Pin connectors allow more control over fan operations, leading to more efficient active cooling. Choose an appropriate fan for your case size. If you have an extra-large case, you’ll want to consider a 200MM case fan, for instance. In this situation, an 80MM fan would do very little to cool your system, as it lacks the force of air flow and RPMs necessary to efficiently move cool air to important areas such as the CPU. The Cooler Master 80MM silent case fan is one of the best options available for smaller cases that are exhibiting symptoms of overheating. If you find yourself irritated by regular fan operation noises, this 80MM case fan can easily fix it, in addition to efficiently cooling your system. Even while running at max power/speed, this fan is nearly completely silent. An 11-blade design and a 3-Pin connector that’s perfect for hooking up to a fan controller are easily the most exciting features of this fan. For a smaller unit, it is incredibly efficient. ARCTIC’s Fluid Dynamic 80MM Case Fan is probably the best budget case fan available to consumers today. Its two-way installation allows you to blow warm air out of your case or pull cool air into your case; which is highly effective as a cooling measure. With a 4-Pin connector, this affordable case fan is ready to plug-and-play, set up with a fan controller, or even directly control your fan’s PWM with software settings. Another great feature of this ARCTIC case fan is the fluid dynamic bearing, which has an integrated capsule of lubricating oil to ensure that operation remains smooth and silent even at high speeds. Other quiet models typically rely on a sleeve bearing to achieve this level of quiet, however, their service life is usually much shorter than that of fluid dynamic bearings. If you’re into aesthetics when it comes to your computer components but aren’t a fan of flashy light displays, the Noctua NF-A8 PWM Premium 80MM case fan just might be perfect for you. Designed with components such as your CPU in mind, this Noctua model was built to stand up to the air flow pressure demands of tight spaces around heat syncs and such. But they didn’t neglect the visual design elements of the fan in order to accomplish this level of efficiency. Not only is it fairly quiet, due to Noctua’s signature SSO bearing system, it is composed of sleek lines, an open design, and perfectly placed blades. If you’re in the market for a smaller case fan set up, this is truly a great option. Don’t let the standard 7-blade design fool you; this SILENTWINGS 3 case fan is anything but standard. A unique 6-pole motor design allows for drastically less power consumption; and thus less vibration as well. Thanks to this feature, the Be Quiet! 120MM High Speed fan is indeed very quiet. Another of our favorite features on this particular case fan is the design of the air inlets. They are funnel-shaped in order to create maximum air pressure; whether drawing air away from overheated components or pushing cool, fresh air across them. At 120MM this case fan is perfect for small or medium size PC cases. If you already have a quality PC build and want to refine it with the incorporation of RGB fans, Asiahorse Model-X (RGBX) comes as a great cheap option. These fans are not a premium product, but a budget solution that delivers decent performance and nice RGB lighting effects at the same time, which makes it good enough for mainstream builds, but not that great for high-end gaming rigs that just demand for more polished hardware. 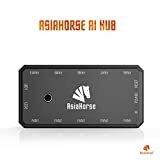 Asiahorse Model-X (RGBX) is overall a great product for its price, with very good lighting effects, silent work, support for liquid cooling systems and respectable performance. It is not perfect and it has its limitations, but for the price that is just a fraction of the other fans’ cost, it is just excellent. If your budget is limited, but want a decent both cooling and lighting solution, Asiahorse Model-X (RGBX) is the optimal choice. A quality solution that will do the job and bring the desired results, but won’t cost a small fortune is always more than welcome, and Corsair LL Series RGB LL120 is exactly one of those products. With 16 fully independent LEDs that can be software-controlled, setting up the desired lighting effects with this fan is more than a pleasant experience. Although its included iCue software isn’t among the best and requires for a bit polishing, it still can be handled. Corsair LL Series RGB LL120 is, first of all, a quality-built fan, with great airflow and silent enough performance for most users, which is a result of its fan blade design that minimizes the noise but doesn’t affect the performance. Also, thanks to its PWM control, fan speed can be manually adjusted between 600RPM and 1500RPM to accommodate your noise or air-flow requirements, which is one of the essentials these days. 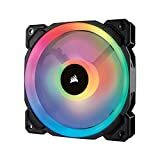 Generally speaking, Corsair LL Series RGB LL120 is an amazing product at a very attractive price. The F12 PWM Rev. 2 Case Fan is another great model designed by ARCTIC; one of the leaders in the industry of case fans and general cooling technology. This 120MM fan is a 4-Pin connector model, which allows you to control the pulse width modification of your fan. 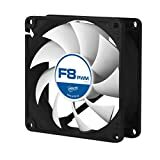 This is useful for heavy duty computer users such as gamers and designers who are battling unusually high operational temperatures. Another benefit of the 4-Pin connector is that allowing your motherboard to control the fan’s PWM will dramatically cut fan noise levels. Constant monitoring of exact temperatures allows the system to appropriately estimate how much power and running time it will take to keep components at ideal temperatures. That means that the fan can avoid running at max power, and thus avoid running at max noise volume. 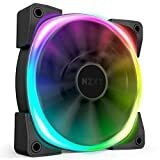 The primary task of RGB fans is to create amazing lighting effects that will make your computer different from the crowd. Depending on the fan features, these effects can vary from discrete to utterly amazing, which is the case with the Thermaltake Riing 12 RGB TT Premium Edition. This three-fan pack comes with 16 predefined light modes, but also, thanks to it’s 30 addressable 16.8 million colors LEDs and a TT RGB PLUS Software, it allows for an unlimited number of possible color combinations and permits for users to create their own unique color creations and even synchronize the LEDs with their music, gaming action, etc. Generally made as a radiator fan, with distinctive nine-blade design, PWM control, hydraulic bearing and specially constructed rubber pads, these fans deliver a silent but great cooling performance with a fan speed from 500RPM to 1500RPM. Thermaltake simply hit in the dead center with the Riing 12 RGB TT Premium Edition, delivering both high performance and a unique-looking product, as any premium product should. Corsair ML140, where ML stands for Magnetic Levitation, is a product that introduces a new technology to the industry, and its primary goal is to reduce the noise levels. Built to last, with a custom rotor design and a PWM control, this fan delivers a high airflow and achieves speeds from 400RPM to 2000RPM. Unfortunately, its noise levels aren’t that good. Even though its performance is very silent at low speeds, it becomes louder as its fan speed increases. Generally very stylish, with a decent five-year warranty, this fan presents a quality product, with a decent price and overall a good performance. Although Corsair ML140 is bringing something completely new to the fan market, the fact is that the involvement of a Magnetic Levitation technology actually doesn’t bring any noticeable benefit to the fans performance. Hopefully it will bring something in the future, but for now, this is just a decent product, which is, on the other hand, more than enough in most cases. Noctua NF-A14 iPPC-3000 PWM is, before anything else, a premium product that doesn’t make any compromises. A six-year warranty, great air flow, silent operations and a great set of features for enhanced overall performance make this fan one of a kind product. Advanced acoustic optimization, fully automated speed control, aerodynamic optimization, low-noise-adaptor, and anti-vibration pads are just some of its great highlights. With a PWM control and a fan speed from 800RPM to 3000RPM, this fan delivers the performance that can be accommodated to everybody’s needs. You can use it directly on your chassis for improved air cooling or as a radiator fan, thanks to its square shape that guarantees full radiator coverage. Altogether, Noctua NF-A14 iPPC-3000 PWM is just a perfect thing of engineering, and an excellent and affordable option that doesn’t bring the shiny RGB but does the job, and it does it flawlessly. Being affordable, durable and well-performing at the same time is the crucial aspect of any successful computer hardware, and Rosewill RFBF-131411 fan fits perfectly in that role. With the help of a fluid dynamic bearing, rubber grommet mounts and a 140mm 11-blade fan, it produces a ton of air even at low speeds, while keeping the noise levels at the minimum. Bellow 1000RPM, it is almost silent, while it becomes a bit auditable at its maximum operating speed of around 1300RPM, but not in a drastic way. It is a bit louder than the Noctua NF-A14, for example, but considering its low price tag, that is more than acceptable. Rosewill RFBF-131411 is simply a cheap case fan solution, with great durability and exceptional performance per dollar; in other words, the winning combination. If you are looking for some serious PC customization hardware that will not be there only for the sake of appearance, but also with a quality performance, NZXT AER RGB 2 – 140mm is the right product for you. With this fan, you will get a highly efficient cooling tool that is whisper-quiet and eye-appealing at the same time. Thanks to its CAM-software, you will be able to easily configure and set your lighting effects, with an unlimited number of possible color combinations. Unfortunately, although the CAM-software is easy to use, sometimes it can be intrusive and annoying. Therefore, before the possible purchase, be aware of that, along with the fact that the fans have the RGB light only on one side, so if you don’t have a tempered glass side panel, you will have trouble enjoying their awesome looks in the first place. Luckily, those are the only downsides of this otherwise excellent 140mm PWM static pressure fan that can bring a little bit of special touch to any gaming rig. For people looking for a large 200mm RGB fan that will offer plenty of customization options and support for various RGB lighting eco-systems, Cooler Master MF200R RGB comes as a great entry-level option. There is support for Asus Aura, Gigabyte Fusion, MSI RGB and many other similar utilities, so you will have no trouble setting it up to your needs. If, on the other hand, your motherboard doesn’t support RGB, there is always a possibility for an RGB controller purchase that will do the exact same work. This fan comes with numerous features for the enhanced altogether experience, such as the audio absorbing rubber pads, Smart Fan Sensor that automatically stops the fan if the cable is jammed inside it, hybrid jet engine fan design and a lot more. Cooler Master MF200R RGB can achieve a speed of 800RPM, which is more than enough for a fan of this size, delivers a great balance between the performance and a quiet work, and generally presents a good value for the money. It could be said that the Cooler Master MegaFlow 200 is some sort of a cheaper and simplified version of the Cooler Master MF200R RGB fan. Although they look pretty similar, Cooler Master MegaFlow 200 comes without RGB support and compatibility with various RGB utilities, but on the other hand, offers a more silent performance. It comes in editions with single-color LEDs or without them, it achieves a speed of around 700RPM, so overall, it is a good and very silent fan for air cooling. There is nothing spectacular about it, including the price. Its main role is to deliver a good performance under the least possible noise levels and that is something that does amazingly. Therefore, if you want a simple, but large 200mm device that will do a good air cooling job, Cooler Master MegaFlow 200 should be very high on your list. Thermaltake 200mm Pure 2 is an affordable and very efficient 200mm fan that delivers very quiet performance and overall great value for the consumer. Thanks to its shaved design, it is easy to install, while its sleeve bearing guarantees for its durability. 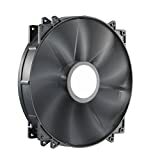 Its specialized fan blade design ensures a quality airflow while keeping the noise levels at the lowest possible level. Similar to other large 200mm fans, Thermaltake 200mm Pure 2 has a maximum speed of around 800 RPM and generally presents good air cooling tool, with low-noise performance. 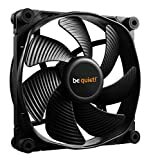 Since this is a 200mm fan, don’t expect it to be perfectly silent – it will surely be noisier than, for instance, similar type 120mm fans, but still, that is more than acceptable for this dimensions. In other words, if you want a fan of this diameter, that is something you just must accept. 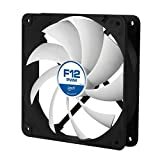 What’s the best way to determine the size of the fans I’m currently running and how would I find out if I can/should run bigger fans? Thanks in advance. Measure your fan horizontally (or vertically as it’s usually a square) from side to side but not diagonally. Usually there is only one size that fits the fan slot. If you have an empty slot for a case fan and want to find out the appropriate fan size, you need to measure the distance between the fan’s screw holes and then add about 10mm (approximately). So if the distance is 70-72mm you need an 80mm fan. Check this “size guide” https://www.quietpc.com/faq/27. Must say you have an impressive knowledge of fans and have listed the best brands from a very crowded market. I do recommend the NZXT FN V2 140MM RF-FN142-RB and any corsair fan. Gelid solutions is also a good brand for the with a budget. Would have been nice to include the CFM of each fan, other than that. I enjoyed the read. Now i still have questions i will find on another review page.